Back in September, when we had our super volunteer Sam staying with us, I got a phone call from Gérémie, a neighbour, to say that our meat had arrived. Some time ago, he had asked me whether we’d be interested in sharing a veal calf. The wife of farming friend had been offered a lucrative job abroad—too good to turn down as, two years before retirement, it would favourably affect the size of her pension from then on. 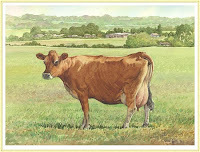 Somewhat reluctantly, he was closing down his farm in order to accompany his wife and thus selling all his stock, an organic dairy herd of Jersey cattle. Male calves are a by-product of milk production and, although veal has had a somewhat bad reputation in the UK due to the way the calves used to be housed in crates, changes in legislation have led to great improvements in the way they are raised. We said “yes” to going halves on the meat yet nothing more was mentioned and I rather thought that it wasn’t going to happen until the phone call, many weeks later. 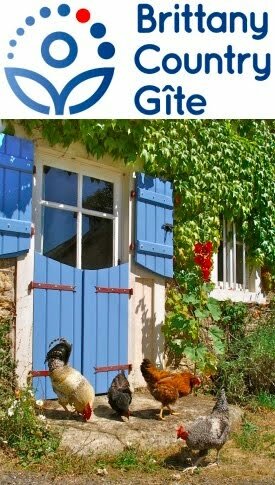 I arrived at his house to find Gérémie, his farming friend and two large cardboard boxes containing our half of veal deal. Now, in a supermarket, cuts of meat come packaged with labels on and, at a butcher’s you’ll be asking for what you need and, in any case, all the cuts on display will also be labelled. We, however, were the new owners of a pile of anonymous portions and so, to try to make some sense of it all before we put it in the freezer we resorted to the bookshelf. 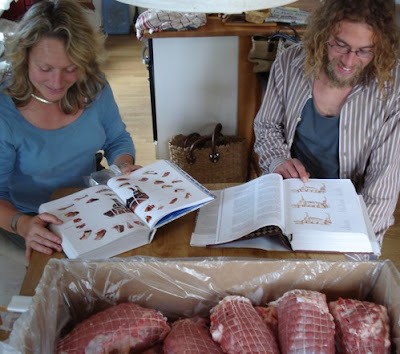 The photo at the top shows Gabrielle and Sam trying to identify the meat in the box with the aid of diagrams in Larousse Gastronomique, an encyclopaedia of food, and Hugh Fearnley Whittingstall’s The River Cottage Meat Book. French and English butchers divide up the carcass differently, which didn’t make any real difference to us as we struggled to make sense of our meaty jigsaw puzzle. It was an interesting experience as it made us look a little deeper into the components of an animal and was a world away from buying a depersonalised square of read meat packaged in a polystyrene tray from the supermarket. One item that foxed us more than anything—unusually so as Gérémie had already told us what it was—was “ris de veau”. The French don’t sound the last consonant of most of their words, so “ris”, on Gérémie’s lips, sounded like “rie” rather than “riss”. Conventional dictionaries have one major problem: if you don’t know how to spell the word, how do you look it up? Between the three of us, we searched dictionaries, entered all manner of versions (rie, rit, etc.) into Google, and searched French cookbooks, until we identified the “ris” as being the thyroid gland, otherwise referred to as “throat sweetbreads”, neither sounding very appetising. The next question was what to do with them and as Sam’s half-French, he conveniently had a French grandmother, who he phoned to ask for advice and a recipe. They are a right old fuss and palaver to prepare, involving steeping in water, then blanching, then pressing as they cool, taking hours and all necessary before you even start cooking the recipe. We had them in a cream and mushroom sauce and they were the delicacy they’re claimed to be, very tasty and with an amazingly light texture and apparently frighteningly expensive at the butchers. In Part 2, I’ll tell you more about our own meat production here on our permaculture smallholding. I don't know if this is any help, but I think the one on the left is female and the one on the right male. Both of the genus Homo Sapiens.